CIRCADIAN MOBILE APP: Circadian is designed to be controlled through gestures, but comes with an accompanying mobile app that can be used to track sleep patterns, set alarms, and to control light settings. FINAL PHYSICAL PROTOTYPE: This prototype made from laser cut acrylic and 3D printed parts. Aside from it's sunrise and sunset functionality, Circadian also doubles as phone dock with speakers to play sound media (podcasts, music, etc) to help users fall asleep. ARDUINO PROTOTYPE: One of my early paper prototypes using arduino and neopixel to mimic the sunset. GESTURE CONTROL: I created a set of six gestures to control the main functionality of the Circadian. For example holding your hand in front of Circadian turns it on an off, while raising your hand up or down controls the brightness level. EARLY PROTOTYPES: I used paper and velum in early prototypes, then experimented with acrylic and 3D printed objects to create more high fidelity versions. 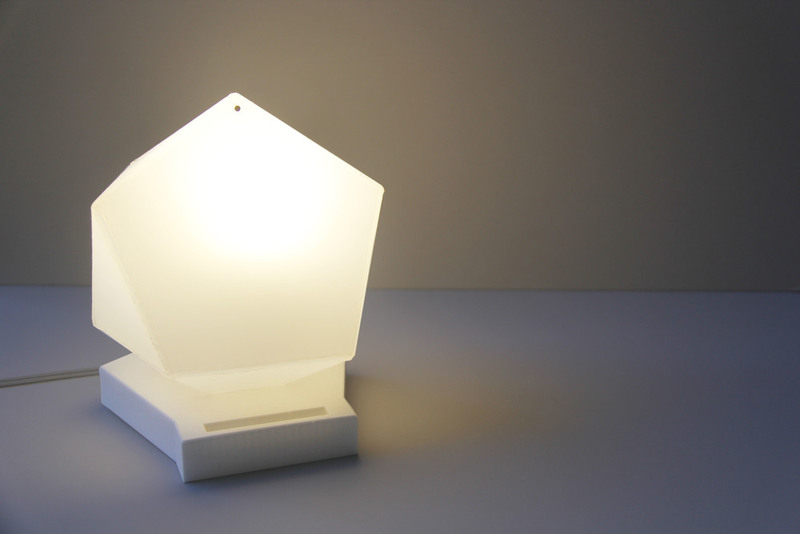 Circadian is a WiFi enabled bedside lamp that helps people wind down for sleep, and wake up feeling rested by mimicking the rising and setting of the sun. Almost everyone I know struggles with falling asleep, and waking up feeling rested. Our environment plays a huge part in our sleep cycle. What if by using technology we could alter our sleeping environment to help us hack the biological processes that aid with getting restful sleep? I stared by talking with people about their sleep habits and rituals. Then I did some secondary research around environments, and the biology behind sleep. I used this research to ideate, sketching and storyboarding concepts for how technology could improve sleep quality. I started by prototyping the physical product. first with paper and velum, next using arduino, connected light bulbs, 3D printed objects and laser cut acrylic. Then I explored how gestures can be used to interact with the light. Once I had the form factor solidified, I focused on the app experience. I sketched screens and user flows, then moved these into sketch. Finally I made an interactive prototype using Principal to illustrate the main functionality of the app. This project was all about using prototypes to explore different directions of a concept, as well as using them align others to a shared vision of a product. My biggest take away was that a prototype is a tool for conversation. It is the quickest way to get feedback about the direction of your work, and to understand how your concept measures up in the real world. STORY BOARD: I created this story board to work through some of the design features before building out the mobile app. Using the physical prototype, I walked through how a user would engage with Circadian in order to understand the use cases, and functionality that would be split between the two touch points. Creating a storyboard helped me to explain my design, and pitch my product idea.